This circle will directly engage students in using restorative questions and working in circles to discuss and begin to resolve conflicts and problems. Note: it is helpful to repeat this kind of circle for two or three (or more) circles, so that all students have an opportunity to participate and several issues can be discussed. Some classes return to it again and again as a core tool for maintaining a positive class. 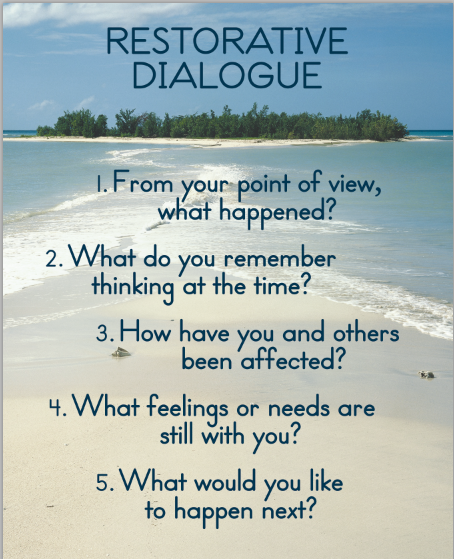 Students will use Restorative Questions to discuss issues affecting the classroom. 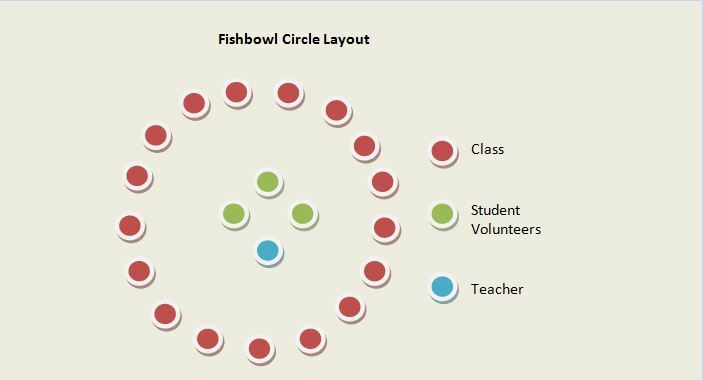 Students will experience fishbowl circle format. Students will gain experience with asking restorative questions. Post the list of issues that the students identified in Circle 3. Post the restorative questions, preferably on at least two walls so students don’t have to turn around to see them. This activity requires that the center of the circle be free of obstructions so that groups of three or four students can pull their chairs into the center for fishbowl circles. Ask students for suggestions for a check-in question. Choose one (or combine a couple). Use the talking piece. Read from the posted list of issues (identified by the class in the previous circle), asking about each issue, “How many students are bothered by this?” Invite the class to notice along with you which issues have the most response. Choose one of the issues and ask students to think of a specific event or circumstance that illustrates how they have been affected by this issue. Ask them to raise their hands when they have thought of something. Ask for three volunteers who are willing to tell their stories of when and how t they were affected by the selected issue, without using names or identifying the people who were involved. When you have three volunteers, move your chair into the circle and have the volunteers also move their chairs in, so together you form a small circle of four people inside the larger circle of students (see diagram below). You will not need to use a talking piece in these fishbowl circles. Ask who wants to go first. Ask this student the restorative questions, in the same order they appear on the poster. Important: be obvious about looking at the poster and reading the questions exactly as they appear. It is very important to model simply asking the questions (and perhaps a few prompts) so students don’t get the idea that the person asking the questions is trying to act as a counselor, mediator, or problem solver. Watch for opportunities to involve the other students in the center fishbowl. Include students in the outer circle, particularly if the volunteer seems stuck. Let them ask for ideas and call on people who have their hands raised. When their sharing seems complete, ask volunteer 1, “Do you feel complete for now?” If their answer is no, ask, “What do you need to feel complete?” This creates an opportunity to resolve anything that still needs attention. Determine who will be the next student to answer the questions (volunteer 2). Turning to volunteer 1, say “You will ask the questions now.” Your focus will be on coaching the student who is asking the questions, while volunteer 1 will focus on the student who is responding (volunteer 2). You will coach and encourage volunteer 1 as necessary to ask volunteer 2 the restorative questions, in the same order they appear on the poster. Important: encourage volunteer 1 to read the questions from the poster, exactly as they appear. If necessary, you can add prompts. Continue to watch for opportunities to involve the other students in the fishbowl, and the students in the outer circle, particularly if the student who is sharing seems stuck. Let volunteer 2 ask for ideas and call on people who have their hands raised. Coach volunteer 2 as necessary to ask volunteer 3 the restorative questions, in the same order they appear on the poster. Continue to watch for opportunities to involve the other students in the fishbowl, and the students in the outer circle, particularly if the student who is sharing seems stuck. Ask for four volunteers, give your seat to one of them, and coach from outside the circle. Your initial role will be to sort out which student will ask the questions first, and which student will tell their story first. This approach is very empowering of students. Or do it the same as for the first circle. 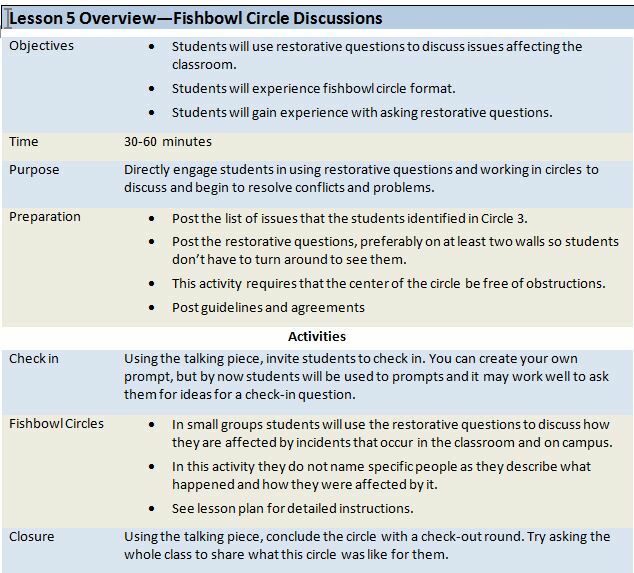 Ask for ideas about what procedures to adopt to request a restorative circle when there is an issue that is affecting the class (e.g. “Circle Suggestion Box”). If you don’t have time, remember to come back to this later. Using the talking piece, ask students to share what today’s circle was like for them.